Increasingly often I am being asked by students, colleagues, investors, even friends and family “What is Fintech?”. I then typically answer “Fintech is an industry made up of organizations using novel financial technology to support or enable financial services”. And then, to avoid misunderstandings I add “A Fintech is an organization that uses novel financial technology to support or enable financial services”. Yet, what sounds like a pretty straight-forward answer, was a hard nut to crack. In fact, the term Fintech is so often and widely used that some people even increasingly shun using it altogether. * To them the concept of Fintech has become too comprehensive and too ubiquitous to have any conclusive meaning any longer. For me it required quite a thought process to come up with a telling definition. This is due to several reasons. First, a definition is never true or false per se, but more or less useful in a specific context. For instance, think about the term “power”. How would a physicist define it? How a politician? Which definition would a judge provide? Which explanation would an athlete give? Moreover, even within the domain of sports you are likely to receive different answers, depending on whom you ask. A weight lifter will most probably provide you with a different answer is than the fellow athlete from the same Olympic team who competes in synchronized swimming. Hence, we have to accept that – contingent on the counterparty you ask – one may well receive varying answers on the identical question. The same applies to the expression Fintech. Looking at the most popular encyclopaedia of our times, Wikipedia, we can read that “[f]inancial technology, also known as fintech, is an economic industry composed of companies that use technology to make financial services more efficient.” (Wikipedia, 2016a). Conveniently enough for the reader, Wikipedia also provides us with the source for their definition. Wikipedia refers to the Wharton FinTech Club which provided this definition (Wharton Fintech, 2014). In a similar vein Susanne Chishti and Janos Barberis state in their landmark book on Fintechs that “Financial Technology or FinTech is one of the most promising industries in 2016” (Chishti & Barberis, 2016, p.5). The Oxford Dictionary tells us that Fintech is a mass noun (Oxford English Dictionary, 2016). More specifically this most authoritative source for British English suggests that Fintech are “Computer programs and other technology used to support or enable banking and financial services: fintech is one of the fastest-growing areas for venture capitalists”. In this context it may also be noteworthy that the most widely used dictionary and thesaurus for American English, Merriam-Webster, does not offer any definition for the term (Merriam-Webster, 2016). On one popular Web sites in the Fintech sphere one can find the following definition “Fintech is a line of business based on using software to provide financial services.” (Fintech Weekly, 2016). Interestingly enough on that very Website reference is made to Wikipedia which – at least today – provides a different definition. On another blog from the finance world one can read a definition provided by Harry Wilson of Claro Partners: ”FinTech is an ecosystem of startups” (Wilson, 2015). We could almost indefinitely continue this exercise of extracting definitions for the term Fintech from various authors. 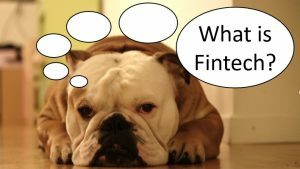 Yet, already from this very short although not representative selection of definitions, we can conclude that there is a vast range of meanings of the word Fintech: from “computer programs” and “other technologies” over “line of business” and “ecosystem” to an “industry”. This plethora of connotations makes it hard, if not impossible, to distil one commonly accepted explanation. Interestingly enough even some of the biggest consultancies which certainly employ some of the smartest minds on the planet shy away from defining the term Fintech. Regularly one can find reports on Fintech related topics which do not provide any definition of the term Fintech itself; see for instance the McKinsey report on the effects of Fintech on banks by Dietz, Khanna, Olanrewaju & Rajgopal (2015) or the BCG report on the opportunities Fintech provides to corporate banks by Dany, Goyal, Schwarz, Berg, Scortecci & Baben (2016). The second reason, why it is so inherently difficult to define the concept of Fintech is because definitions change over time. Also here we have some analogies. As an illustration think about the expression “information technology” (IT). In the early days of computing IT stood for items such punched tapes and cathode ray tubes. Today, however, we much rather associate things such as Motion User Interfaces, Bots and the Internet of Things with IT. Consequently, it is also safe to assume that the expression Fintech undergoes change. The definition provided by Investopedia pays tribute to this fact: “Fintech is a portmanteau of financial technology that describes an emerging financial services sector in the 21st century. Originally, the term applied to technology applied to the back-end of established consumer and trade financial institutions. Since the end of the first decade of the 21st century, the term has expanded to include any technological innovation in the financial sector, including innovations in financial literacy and education, retail banking, investment and even crypto-currencies like bitcoin.” So, for the authors of Investopedia, Fintech was originally an expression describing banking backend technology, but widened over time to also encompass technological innovations in financial services and related areas (Investopedia, 2016). Following the authors of Investopedia Fintech is not just a mere industry, but also a technology and an expression for innovation. So far we have been talking about “Fintech” – without prefixed article. However, during conversations, but also in texts one also regularly encounters the expression “a Fintech”. Is there a difference between “Fintech” and “a Fintech”? If so, what is the difference? To my experience people typically refer to a Fintech company or more specifically to a Fintech start-up when they talk about “a Fintech”. Hence, the difference is the “level of analysis” as the scientist would say. As explained above “Fintech” without article typically relates to an entire a group of objects whereas “a Fintech” is just one single entity. This apparently small difference by the prefix “a”, can give rise to serious misunderstandings. To a politician, for instance, it will make a world of difference, whether he or she is asked to support creating an industry cluster or even entire industry or just one single firm. The same goes for a venture capitalist albeit with opposite signs. Fourth and last, confusion about the term Fintech emerges from the fact that definitions can vary across languages. To illustrate this fact, I recommend to take a look at the various definitions of Fintech provided by different language versions of Wikipedia. The Italian site, for instance, states that Fintech is the “provision” of financial products and services using information technologies [“La tecnofinanza, o tecnologia finanziaria (in inglese Financial Technology o FinTech) è la fornitura di servizi e prodotti finanziari attraverso le più avanzate tecnologie dell’informazione (TIC)”] (Wikipedia, 2016b). By contrast, the German Wikipedia definition of Fintech suggests that Fintech is an umbrella term for “modern technologies in the area of financial services” [“Finanztechnologie (auch verkürzt zu Fintech bzw. FinTech) ist ein Sammelbegriff für moderne Technologien im Bereich der Finanzdienstleistu ngen”] (Wikipedia, 2016c). The French Wikipedia version is much closer to the English one, yet it does not define Fintech as an industry, but more loosely as an “area of activity” [“La technologie financière, ou FinTech, est un domaine d’activité dans lequel les entreprises utilisent les technologies de l’information et de la communication pour livrer des services financiers de façon plus efficace et moins couteuse”] (Wikipedia, 2016d). Hence, just by comparing across languages one can already fathom the potential for misunderstandings. While the Frenchman may be talking about Fintech as a business segment, the German may be speaking about technologies, the Italian about a delivery channel and the native English speaker may refer to an entire industry. Being aware of potential pitfalls is all the more important as the term Fintech is derived from the English words Financial Technology and also used as such in various other languages. Thus people may automatically assume that they talk about identical things whilst they are not. In addition one should bear in mind that Fintech is a global phenomenon. Running into questions of semantics across languages may happen easier than anticipated. However, we can live with this ambiguity in definitions. In fact we have been living with this ambiguity for years, if not decades, in other fields of business and academia. For example, think about the term “strategy”, “innovation” or “business model”. We use them on a daily basis, yet we have not established one common definition for any of them. Hence, having not one single definition for the word Fintech has not and should not prevent us from using it. However, when talking about Fintech we should make clear to our audience what we mean by Fintech. Providing a little explanation for our audience may therefore significantly improve the efficiency of communication and reduce the potential for misunderstandings. If you want to be extra polite you may also want to explain to your vis-à-vis why you use one specific definition and not another. Once more I want to stress that none of the definitions provided above are right or wrong as such. Rather than that they are more or less useful in certain contexts. The definition I provided above, “Fintech is an industry made up of organizations using novel financial technology to support or enable financial services”, is very similar to the one provided by the Wharton Fintech Club and which is being promoted by the English Wikipedia site. Yet, I prefer to use the more broadly defined word organization instead of company. Companies are typically profit seeking and hierarchically organized. More and more often, however, we see non-hierarchical organizations such as The DAO to play a major role in the Fintech domain (The DAO, 2016). I purposely want to include these organizations in my definition. What is more, I tightened my definition in comparison to the Wharton definition by extending it for the word “novel”. I did this because otherwise the more comprehensive Wharton definition would also include just any incumbent bank running on Cobol-coded host systems as they are using this (admittedly ancient) technology to be more efficient. Lastly, I added the verb enable to my definition of Fintech as I am convinced that Fintech is not just about enhancing efficiency, but also more fundamentally about enablement. The distributed ledger rendered possible by Blockchain technology or micropayments made available through telecommunication systems are just examples for theses empowering technologies. Attention should be paid to the fact that innovation emanating from Fintech can be anything from purely complementary to highly disruptive. If the innovation is barely supporting an existing business model in financial services it is likely to be complementary, whereas it will receive the label disruptive if it jeopardizes existing business models. I am well aware of the fact that the definition I use is far from perfect. For instance, it does not provide definitions for its components. Hence, one could rightly ask, “So what do you specifically mean by ’industry’ and what by ’novel’”? And how do you delineate ’industry’ from ’ecosystem’?”. Moreover I am certain that also the definition I use nowadays will change over time with the advancement of technology and the evolution of business. Last but not least, there are many terms up and coming that constitute for spin-offs of the overall Fintech theme. Among those are “InsurTech”, “WealthTech”, “RegTech”, just to name a few. Time will show how are they will be used. Nicolas Steiner, one of the founding members of Level39 recently shared an anecdote about a meeting with a couple of French speaking experts from the telecommunication industry who asked him whether Fintech stood for “the end of technology”. The reasoning for that being that they believed that Fintech was short for the French expression “la fin de la technologie”. I hope by providing and spreading sense making definitions of Fintech we will encounter less and less of such misunderstandings in the future. Spiros Margaris, who is often referred to as one of the Key Influencers of Fintech scene, once stated “Fintech will never disappear, only some fintech startups will disappear.” No matter which definition was used here, it is almost safe to say that this statement will come true. Dany, O., Goyal, R., Schwarz, J., Berg, P. v. d., Scortecci, A., & Baben, S. t. (2016). Fintechs may be corporate banks’ best “Frenemies”. Dietz, M., Khanna, S., Olanrewaju, T., & Rajgopal, K. (2015). Cutting through the FinTech noise: Markers of success, imperatives for banks. In G. B. Practice (Ed. ): McKinsey & Company,. Personally, I give Bill Gates credit for many a thing. Without his technology vision and his business acumen our daily lives would look totally different today. Yet, despite many sources on the Web claiming so, I give him no longer credit for the statement “Banking is necessary. Banks are not.”. 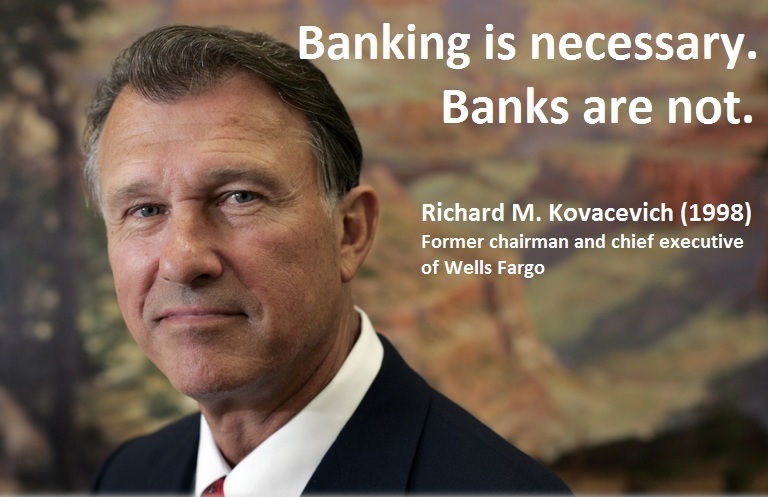 After some tedious research on the Internet as well as in literature data bases the most convincing source of this quote became for me the former chairman and CEO of Wells Fargo, Mr. Richard M. Kovacevich. See Nocera, Joseph (1998): Banking is necessary-Banks are not. Fortune. May 11th, Vol. 137, Issue 9, p.84. However, should you have any hard evidence proving the opposite, please do drop me a comment. Thanks! Dr. Patrick Schüffel, A.Dip.C., M.I.B., Dipl.-Kfm. Innovating is intrinsically difficult. Coming up with an idea for a new service or product is just the mere beginning of what oftentimes turns out to be an extremely cumbersome journey. Moreover, the banking industry in particular is not especially innovation friendly. Being aware of obstacles on the road can help to clear those hurdles. 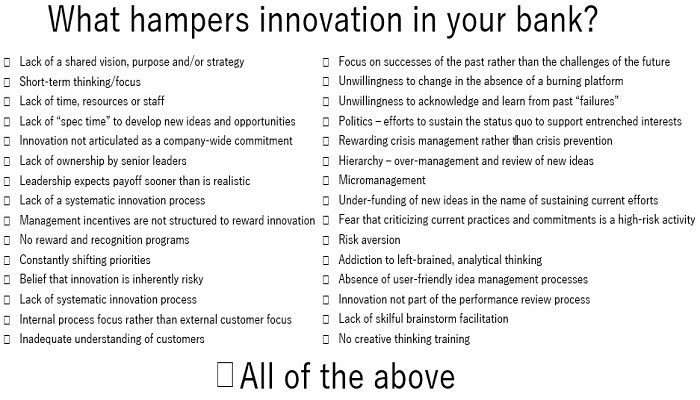 So, whenever you enter on an innovation journey, spend a few minutes thinking of potential causes for troubles.